In recent years, Paul coauthored a book with Ben Johnson on making a personal retreat (Time Away, published by Upper Room: 2010), and has focused on spiritual formation and leadership development in the church. In 2010, Paul led the Fall Spirituality Retreat at Montreat through the Columbia Theological Seminary Certificate in Spiritual Formation (topic: Liturgy of the Hours) and he will return to Montreat in the Spring of 2017 to teach on this subject again. He has been an instructor for the Synod of Lakes and Prairies Synod School, the Presbytery of the Northern Plains, and continues to write and teach in a variety of other settings around the country. Paul is currently writing a book about pilgrimage and the pilgrim's compass for Westminster John Knox Press. In recent years, Paul has also been developing a new congregation-based ministry of adult faith-formation called The Pilgrimage. To learn more, go to www.thepilgrimage.net. For Christians hearing the call to go deeper — The Pilgrimage creates a community and provides tools and experiences through which we learn to hear the call of God and respond in faith, journeying together with friends on the path to a Spirit-led and joyful life. 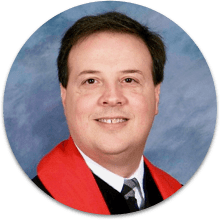 Paul studied with Ben Johnson during his Masters of Divinity degree program and later in his Doctor of Ministry degree program. Ben remained a friend and mentor to Paul until Ben’s death in 2016. In recent years, Ben and Paul were working jointly with Jane Hubbard to develop The Pilgrimage as a powerful ministry of renewal and transformation in local congregations. Paul is proud to continue to work for the renewal of the church through the ministry of The Pilgrimage which is the principal focus of the Institute of Church Renewal for the coming years. To learn more about Paul’s ministry in Fargo, or The Pilgrimage visit his website www.paulhlang.com or email him.